Something came in the mail . What could it be ? ...I reckon that wily old scope-restoring expert Tom has called in all his favours from his far-reaching "network" to be sent an unused Goto objective set: as of right now he is installing it to announce the good news - although I suspect he had also thought of claiming that he'd restored the bad lens by rubbing it with Spam as recommended by another prominent "Classics" gastronome...that or using one of his special varnish/stain mixes. Some genuine Towa replacement glass? So What Came In The Postal Box ? EVERYTHING ! ...... Everything to bring this restoration back to OEM specifications . 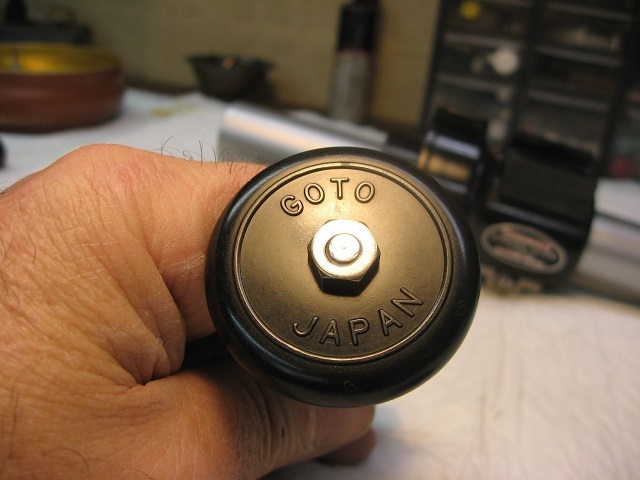 gentleman has for the Goto brand telescopes and it's maker , Seizo Goto . I think these Gotos are really neat. They are Nikon quality optics and Unitron build quality for the most part. They don't get enough press and this is exactly what we need is another restoration effort (and to salvage another scope to be appreciated for simply how great it is). Seizo Goto was first and foremost an observer and proponent of people getting out and observing. So yes, happy to move this lens your way. 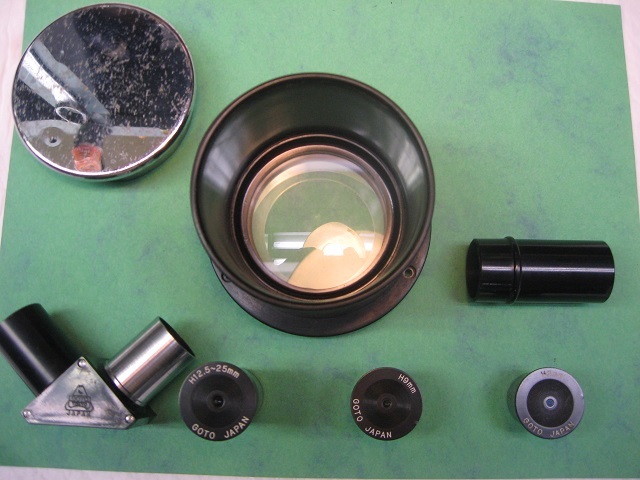 members are towards the preservation and usage of these Classic Telescopes . Now if you'll excuse me , I believe I have a telescope to restore . Thanks Tom, but we have to back up a bit and thank Peter B. For want of a mount, he started providing access to these parts to those in need. I was but a short term caretaker for this telescope (after Dave Trott) that provided an eyepiece tray to Bomber Bob, tripod legs to me, and now these parts to you. A few minor parts left, but I think it safe to say this 'organ donor' has passed away. Can't wait to see final result. Thanks for the effort. Edited by Stew44, 06 January 2019 - 08:57 AM. What a great rescue!!! Pretty much all of the best of CN represented by this thread. Nice work, Stew44 and Tom "Leonardo" Kiehl! In an attempt to maintain originality I tried to touch up and rub out the OTA paint finish . The results were less than satisfactory . 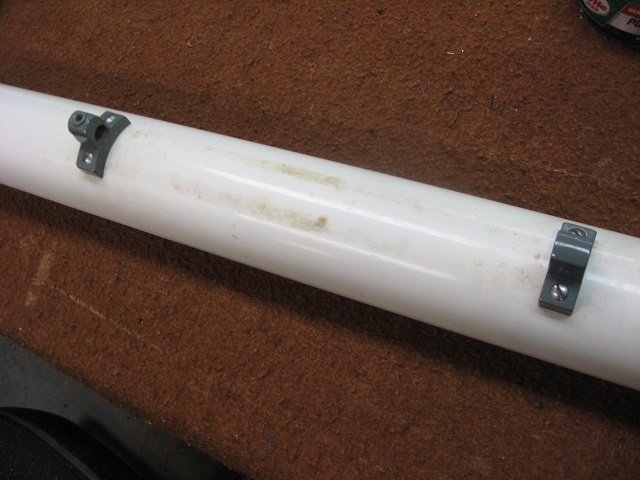 It turns out that sometime in this scopes history it was exposed to a brownish substance something like nicotine . 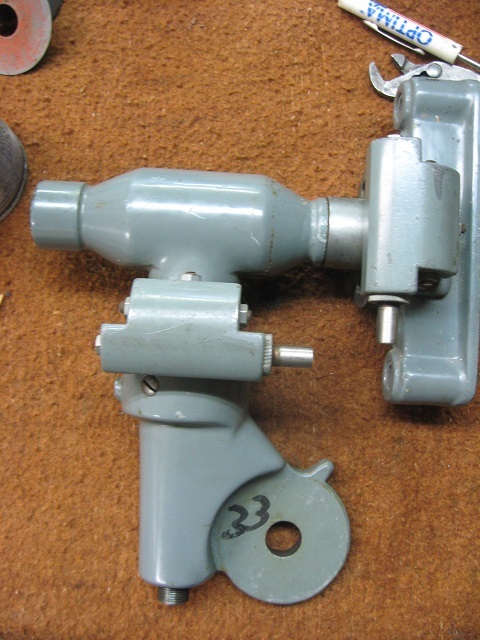 The brownish stain was only on the top 1/2 circumference of the OTA opposite the mount slide bar . Some of it rubbed out with polishing compound but still was visible . Nicks and scratches ( Beauty Marks ) were filled with a 000 brush and Krylon Dover White paint that was a perfect match to the original paint . Once rubbed out the filled nicks and scratches vanished . BUT ...... ( Ya just knew there would be a " BUT " ) .... was a blemish that measured 3/4" x 5" by the green lid in the image below . That " Blemish " appeared to be a area that the top finish paint had separated from the underlying primer ( Yes Factory Primer ) and was missing . All attempts to airbrush and wet sand just this area produced the appearance of what looked like a " Band Aid " . 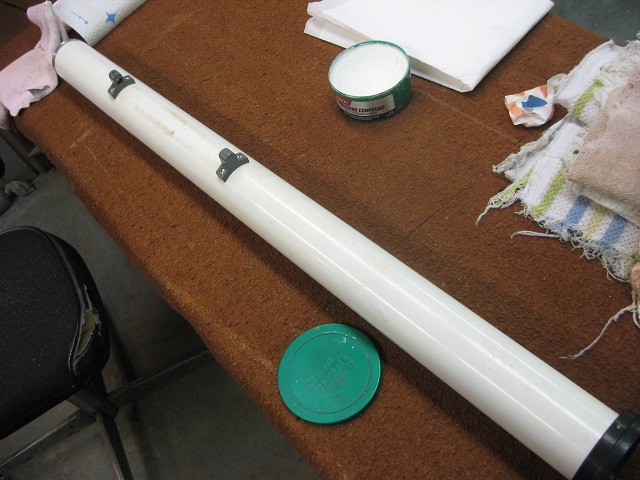 SOooooooo........ A dissension was made to RE paint the entire tube with the Krylon Dover White . All tube threads were cleaned and masked , scuffed the leveled original paint with scotch brite pad and sprayed with krylon in the horizontal position ......WoW ! ..... Glad I decided to re paint , Much better now ! Will let paint cure a week before a final polishing compound will be applied , then wax . I have a similar scope in the same condition, the 60mm Eikow in my signature. It has a wooden case with the veneer delaminating and the OTA needs repainting. However the build construction and finish are excellent, much better than today's gear. I am using the wooden tripod for my 5" mak and it is very stable. There are other things that need attention . 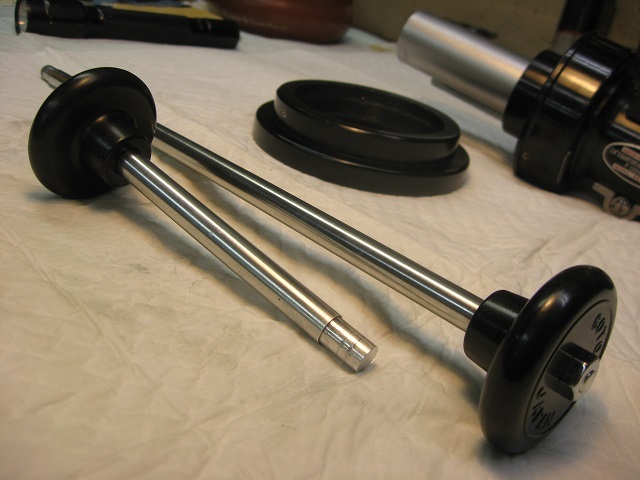 I disassembled , de greased , rubbed out and waxed , re greased with Super Lube and re assembled and adjusted the focuser assembly . I also cleaned and polished the slow motion controls . This build never fails to amaze me . 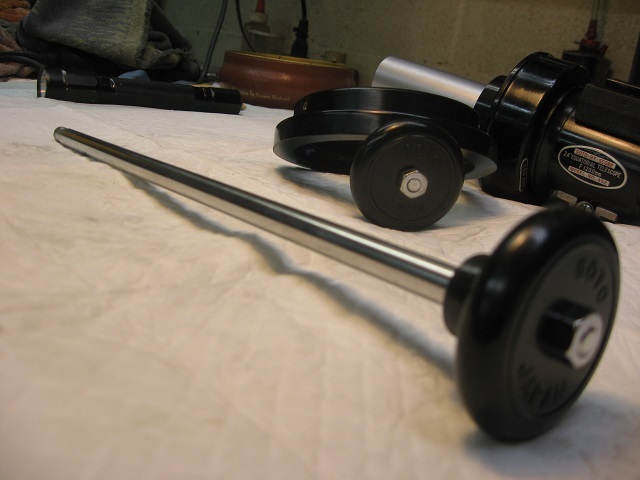 The extensive use of Bakelite parts (all black colored parts ) . Mechanical design and attention to details not to forget Fit and Finish . This is going to be one smooth baby when finished . Aha! Caught you out Tom! - Stew didn't really send you a good Goto objective replacement - you fixed that "Galactic Swirl" with "Formula 1 SCRATCH OUT - SCRATCH & SWIRL REMOVER"
I am particularly interested in your overhaul of the mount. It's something I need to do to mine and I always turn to Youtube for stuff like this (and now you're gonna be my Youtube reference). Tune in tomorrow for the next episode . If you folks have any question on anything that I might have not described .....Please feel free , I'll try to answer to the best of my abilities . These Goto's are truly in a class of their own . This is my first Goto restoration and I'm venturing into uncharted territory for the first time ( For Me ) . I have never seen so much " Hardware " ( Jam nuts , grub screws , pivot screws , tapered pins , springs ,etc. ) brought together to form such a finely tuned instrument ever . Did someone say , Mount ? I have read all of the links on the Goto mod 105 Hy-Score 452 (my scope ) . Thanks Stew for gathering all this info to one place . I did not want to be too repetitious of other peoples links and their experiences of their restorations . I did find that some of those links lacked the info that I needed to help me with my resto . I will try to cover some of that lost info here in this post . First and for most ....Take lots of photos before disassembly . 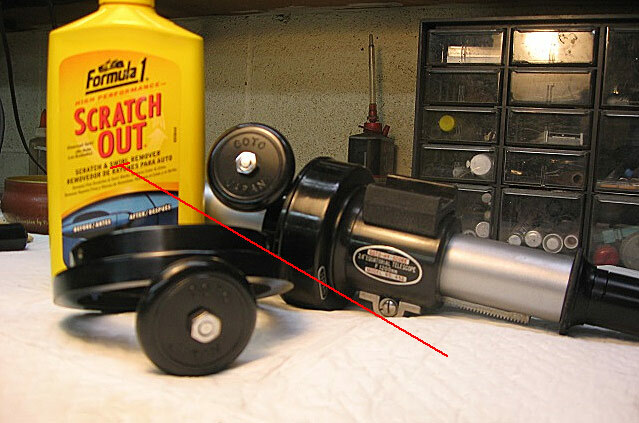 First off I did run into the same problem Bomber Bob had with his attempt of removal of the dreaded tapered pin( circled in red in the image below ) that holds the key to disassembly of the DEC shaft assembly . Reference BB 's post .... https://www.cloudyni...resh/?p=7734455 To Quote BB " The PIN through the DEC axis wouldn't budge from either side. My first rule with restores is like a doctor's oath, First do no harm. I tried both sides with my tap set, then called it quits. 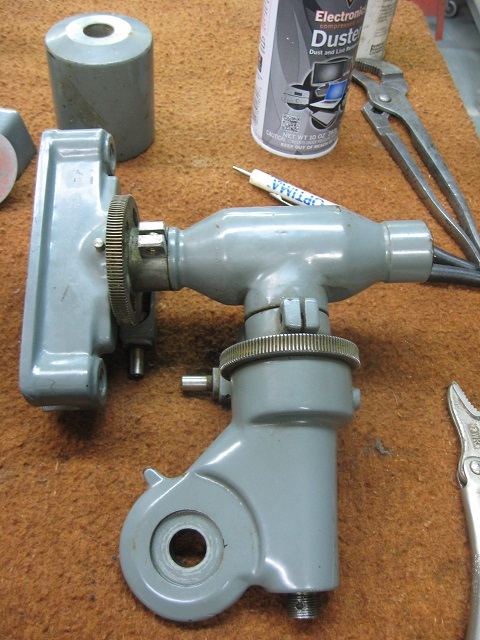 Luckily, this axis turns smoothly, and really didn't require a re-greasing." Thus was the same case for me and I took BB's stance on this issue and did the same as He ....IF.....I just had to get this apart I think a PRESS would of been in order ( Something I don't have ) . Taping with a pin punch on the small end of the tapered pin started to deform the pin . Made it larger , a mushroom effect , if you will , hence making the pin tighter on that end . If a press was used , a increasing constant pressure should push the pin out without deformation to the small end of said tapered pin . After reading BB's thread and watching Dave Trott's video ..... https://www.youtube....h?v=vdzBuAb41c4 ...... I knew that SPRINGS were involved ..... My biggest fear was that the springs would take flight during disassembly for parts unknown in my shop . ..... Disassembly instructions could not be found for these . So as a precaution , I had to work blind , I laid a old bath towel over the mount , tools , and my hands , while I disassembled the first worm box to prevent flying Springs . Once dissembled things seemed so much clearer . BELOW are images of first , The DEC slo-mo worm box , then the RA slo-mo worm box . I laid these out in a exploded view to see how they come apart . Luckily the springs are captured in their own counter bores . As you can see in the 1st image the tiny " grub / set screws " . 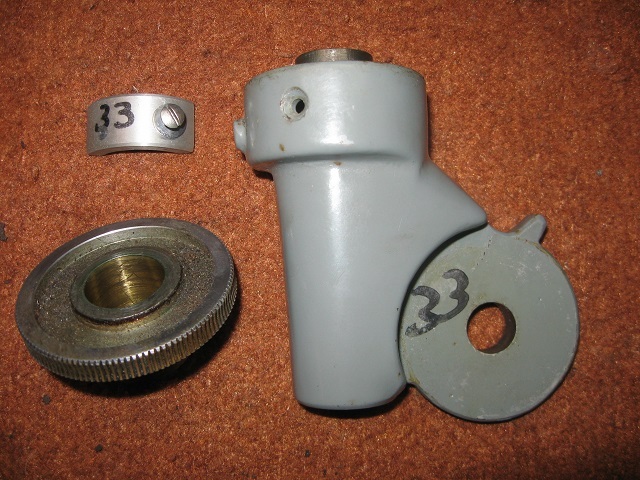 These lock down the pointy pivot screws once adjusted , and must be removed for disassembly ( same for both worm boxes ) ... ALSO (not shown) , " Grub / set screws " are used for both ends of the worm gear ( Drive end and idle end ) . One for the drive end worm retainer and the other for the worm end play adjustment screw . Why springs you say ? ......Simple .... Simplicity at it's finest ! shear Genius ...... The springs provide even and equal pressure on the drive worm against the worm gear mesh . 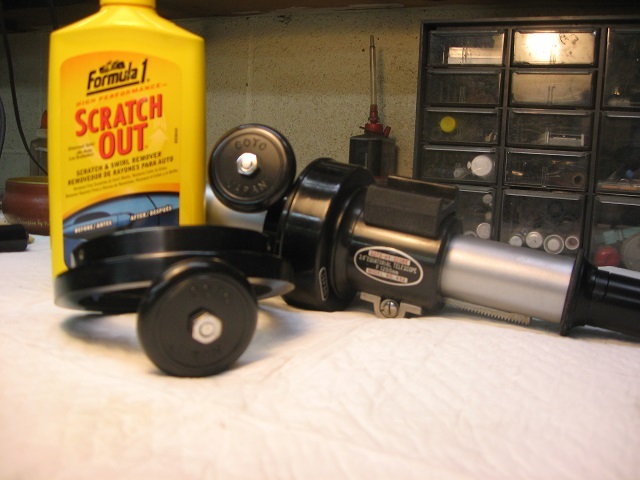 This spring set up compensates for worm gear run out and provides a smooth and even feel during rotation . Thusly eliminating the need for gear lash . After viewing Dave's wonderful above linked video . I have to question the need for the worm box and worm to totally disengage from the worm gear . This seems like a disaster waiting to happen . 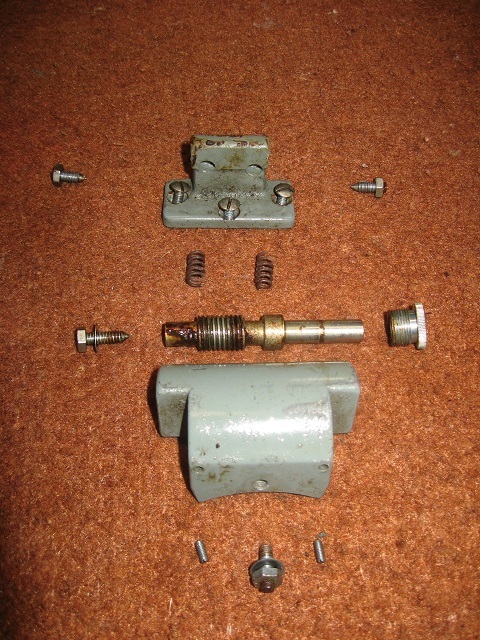 Prior to my disassembly , My two worm box assembly's Did Not Totally disengage from the worm gear ( due to a travel limiting set screw ) seen in both images between the two pivot screw , grub / set screws . Edited by TOM KIEHL, 09 January 2019 - 12:49 PM. 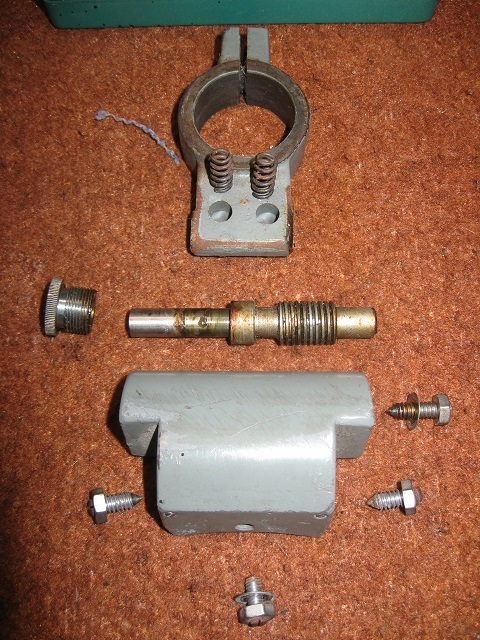 The RA casting , Worm gear , and lock pad assembly . Now my most favorite part ......Touch Up . First I clean and de grease , then polish all painted castings . I try to get to as clean and polished original painted finish as possible . You would be surprised how many marks can be removed with a good automotive finish polish first . Plus it gives a truer color tone to match your touch up to . Once a clean and polished surface is achieved , I try to match the color as close as possible . 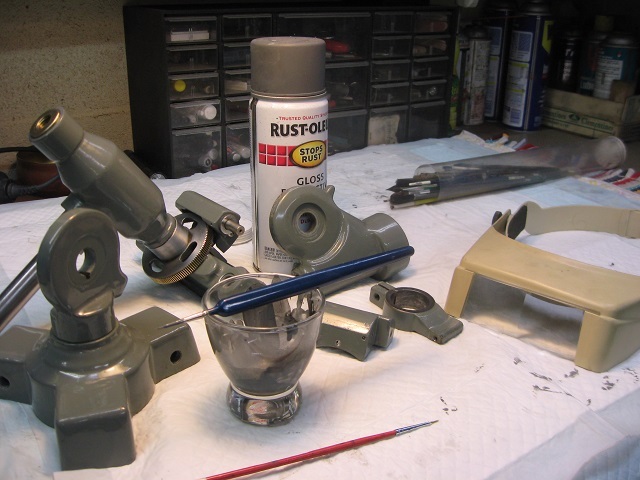 In this case I found that Rustoleum smoke gray gloss enamel was a good base to start from . The smoke gray straight out of the can was to light to match the original Goto gray . In this case I had to darken the smoke gray with a sprits of gloss black . 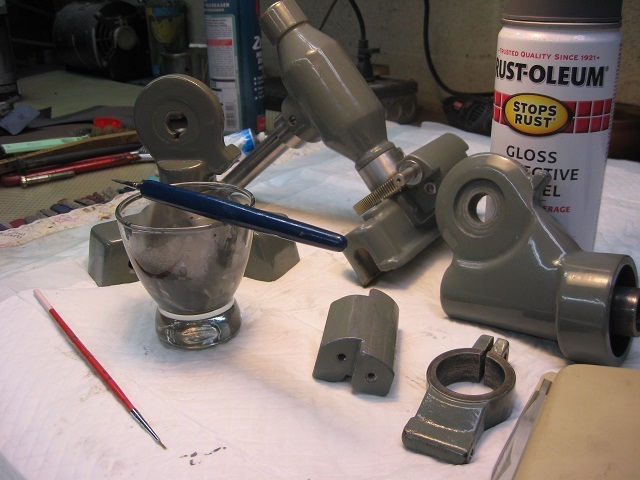 I spray the gray out of the can into a glass cup then add and mix in the black till desired tone is achieved . No need to thin the paint , it's thin enough right out of the can . 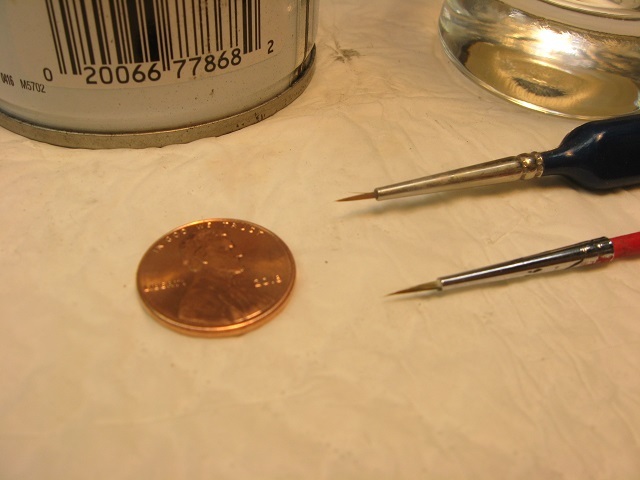 Then I use a 000 brush to fill ...... JUST THE MISSING PAINT CHIP OR SCRATCH..... With practice you can fill the missing chip back to the surface of the original paint level ..... Yes I know ...OCD sets in again ... When paint has cured you can then bury the finish in several coats of a good paint wax . In this case I think I'll use Mothers Carnauba automotive wax . NOTE : The parts in the images below still need to be waxed . Edited by TOM KIEHL, 09 January 2019 - 02:30 PM. Great job Tom ! Boy I wish you guys would spend this much time and care on optics. Tom, one of the things you can try as well is to add touch-up paint to just above the height of the original paint. 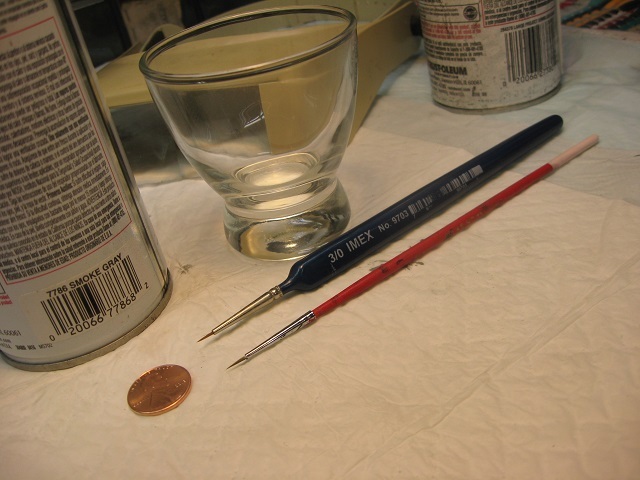 Then use compound (followed by polish) to bring the height of the touch-up back to the height of the original paint. 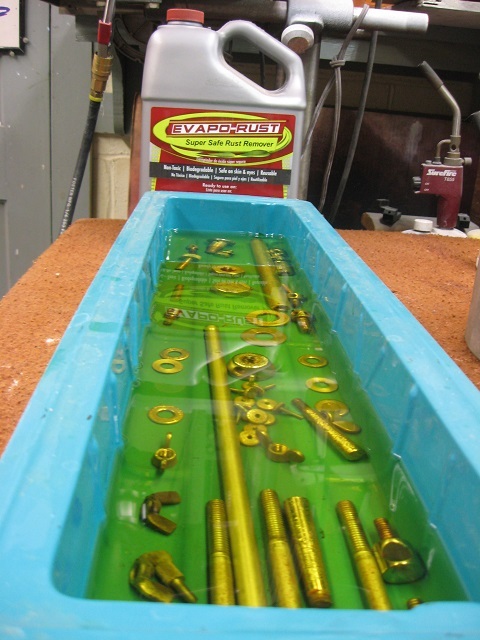 You'd make/use a very small block under the cloth you use with the compound/polish. I'd seen this on one of the car mailing lists some 20 years ago.